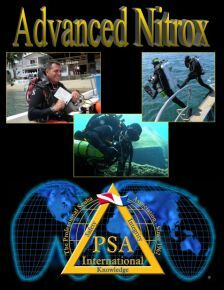 The PSAI Advanced Nitrox Diver Manual is written for those divers who training to utilize enriched air (Nitrox) at oxygen concentrations up to and including 100% by volume (EAN22 to Oxygen) in their diving activities, including stage decompression procedures. Nitrox Defined and the Benefits of Nitrox for Technical Divers. The Physiological Concerns of Using Nitrox. The Physics and Math of Nitrox for Technical Diving. The Equivalent Air Depth Concept. Nitrox and the Use of Dive Tables. Nitrox Compatible Equipment for Technical Diving.